Full disclosure: I cannot objectively review Pomelo Paradis because I am a one-woman Ralf Schwieger cult. (We are currently accepting new membership. Dues are payable in perfume samples. All hail Ralf.) Mr. Schwieger was the one and only perfumer who responded to one of the hundreds of increasingly desperate networking emails that I sent during my year in New York. And not just responded- he generously put me in touch with his fragrance firm’s office manager, who called me in for an interview that very same day. 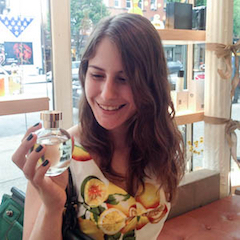 I am still awestruck by the kindness and helpfulness he showed to an unknown, lowly aspiring perfumer. Ralf Schwieger for sainthood! Ralf Schwieger for Pope! Hillary Clinton/Ralf Schwieger 2016! Even pre-cult, Ralf Schwieger was one of my all-time favorite perfumers. From Frederic Malle Lipstick Rose to Hermes Eau de Merveilles to Atelier Cologne Orange Sanguine, he never fails to deliver creative, vibrant fragrances, and Atelier Cologne Pomelo Paradis is no exception. Pomelo Paradis opens with one of the most thrillingly realistic grapefruit notes in fragrance history. I can detect some tangy blackcurrant, but I don’t get any of the florals that are supposed to be in here. Pomelo Paradis stays perfectly juicy and bitter for about half an hour before softening into a quieter, sweeter grapefruit scent, where it stays for the remaining two hours. I wish that the gorgeous top notes lasted longer, but Pomelo Paradis is priced decently enough that I don’t mind reapplying. Compared to some other classic grapefruit scents, Pomelo Paradis is rounder/fuller than Hermes Eau de Pamplemousse Rose and a bit sweeter than Guerlain Aqua-Allegoria Pamplelune. I spotted PP in Sephora yesterday but my nose was too tired to smell it properly. I need to try it first next time I visit that place. It is such a relief to have an artist turn out to be just as lovely as their work. Excited to hear your thoughts on PP! I love everything he creates. I can’t wait to try this. He definitely seems to go for a quality-over-quantity approach- maybe one perfume a year, but virtually no duds so far. What a lovely compliment, marianowrites! Thank you! I love Pamplemousse Rose, too- very bracing and energizing. Hehe, this was so entertaining to read. I really hope to try this one soon. I ❤ pomelos. Big time. I have been watching this one! Pomelos are my thing! Do you have any other good pomelo recommendations for us, Azar? Atelier Cologne has put out so much lately – I can’t keep up. Might go buy their sample collection. They’re definitely picking up speed on the new releases- hopefully they can avoid the Bond route! Awesome. I am already a member of this cult and expecting to love this but it is so good to hear your thoughts on it! What a lovely and entertaining review 🙂 I’ve got an Atelier Cologne sample set waiting in a drawer for when I get the urge to try LOTS of new fragrances… For the past couple of months I’ve been happy wearing the bottles/samples I already have, but I’m prepared for when the bug bites again. Sadly it doesn’t include Pomelo Paradis! Thank you for such a nice compliment, yellow_cello! I hope you pull out that sample set sooner rather than later- Atelier Cologne is truly one of my favorite lines. Orange Sanguine is one of the best citruses in the world!